a good collar and leash is essential. 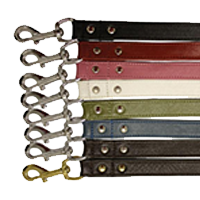 We stock hundreds of leashes and collars, in numerous sizes and colours for your dog to look stylish in, including nylon products, chains, and even Harley Davidson Leather! Retractable leashes are perfect for dogs that like a bit more room to roam. And for the “pullers” out there, we have several harnesses that will give you some added control, while removing strain from your dog’s neck and distributing his force throughout his chest area. Among the many brands of leashes and collars we carry are Angel Pet Products, Lil’ Pals, Harley Davidson, Disney, and Remington. We have hundreds of collars, leashes and harnesses in store. Below is just a quick look at a few of them. Our original designs are all handcrafted in very soft 100% genuine cowhide. You will find these collections to be amongst your customers favourites. Whether you are searching for studded, jewelled plain or any other metal fitted design, you will find them all within this range. 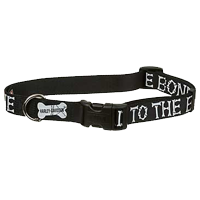 In a variety of colors, and sizes to fit all dogs, from toy breeds to Saint Bernards. 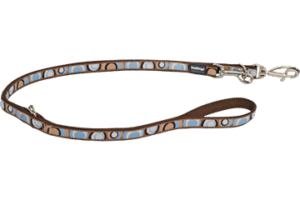 Perfect for walking, pulling and tracking, this light weight yet super strong harness is made of 100% genuine cowhide. The harness is fitted so that the pressure will be on the dog?s chest and not on the neck. Can be completely fitted in under 5 seconds, you will this harness to be the best in the market in terms of comfort, weight, simplicity and quality. Available in black and brown. Size ranges from SM to XL, fitting dogs 30lbs-90+lbs. 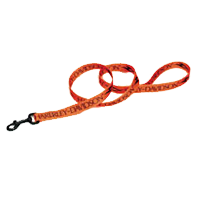 This leash is made of the softest genuine leather available in the market. The padded handle is sure to keep you comfy and snug as you walk your dog. 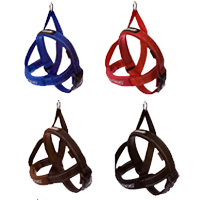 Available in an assortment of colors and sizes, these leads are the perfect match for any Angel collar! Perfect for the growing pet, these adjustable collars feature outstanding, colorfast graphics and are beautifully printed on both sides. 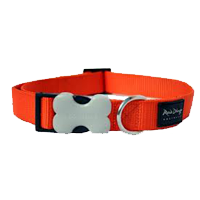 The snap-lock buckle on these adjustable nylon collars is contoured to fit the pet’s neck more comfortably. Available in several width options and color choices. 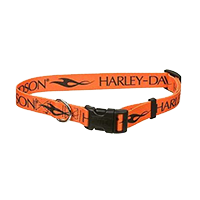 Harley Davidson reflective collars and leashes are easily seen by motorists’ headlights, providing maximum safety for pet owners and their dogs. Harley-Davidson logos on silver reflective material with black nylon, complete the look. 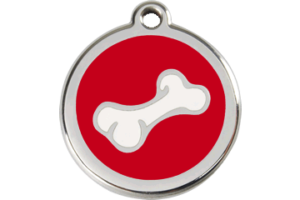 Dog collars are available in small, medium and large sizes across a wide range of reflective, designs and classic colors. Dog harnesses are available in small, medium, large and extra large sizes for dogs with a wide range of reflective, designs and classic colors to match our collars and leads. Fast, Easy, Adjustable Dog Harness. The QuickFit harness really is the quickest, best fitting dog harness out there. One click of the buckle and you’re ready to go! The Neoprene chest strap sleeve gives extra comfort. Reflective stitching enhances nighttime visibility. The stainless steel ring is a secure anchor for leashes. Adjustable straps ensure a comfortable, secure fit. Designed by Dr Roger Mugford, the HALTI Harness has a unique patented front attachment system that controls the dog from his chest and shoulders – an effective point of control. The HALTI Harness stops pulling, calms over-boisterous dogs and simplifies training and behavioural therapy. The benefit of a properly used HALTI Harness is that it gives total control over the dog’s shoulders and thus sets the direction in which he can move. 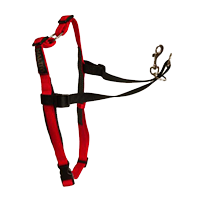 It is best used in conjunction with the double-ended Halti Training Lead, linked to both the chest and shoulder rings of the harness. The specially padded design is extremely comfortable for the dog to wear and is suitable for all breeds.